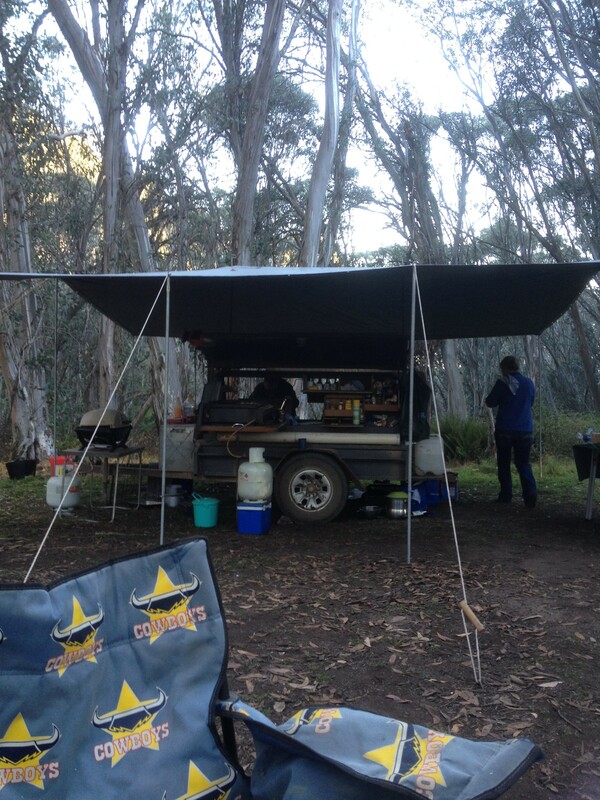 We stayed the first night just below Craig’s Hut. It was really cold – the first true cold we’d experienced all year. I’d taken my son’s new sleeping bag, but hadn’t realised how narrow it was and underneath the swag’s canvas, with thermals on under my flannelette pyjamas, I found I could barely turn over, but it was better than freezing! (I did vow to get a larger sleeping bag for myself though the next time I had to go somewhere I needed a sleeping bag). The horses, despite their exertions of the day, were a bit argumentative during the night and we heard them thumping around their enclosure, having a bit of horsey fisty-cuffs with each other. But even with this disturbing our sleep, my sister and I didn’t mind and woke up the next morning feeling surprisingly good. 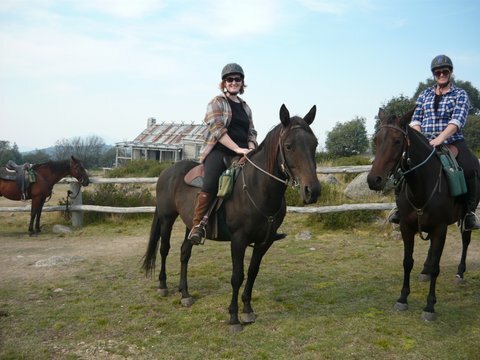 I was certain I wasn’t going to be able to move – I mean, it had been so long since I’d been on a horse and even longer since I’d been on a horse for that long, and it had been hard riding, not to mention that I’ve had a back problem for a few years now that I was worried might play up, especially as I’d had to see the physio before I went away and get some dry needling done (OUCH!) because I’d had spasms in the muscle, but the movement of the horse was quite soothing on the back muscles and my back felt better than it had for some time. 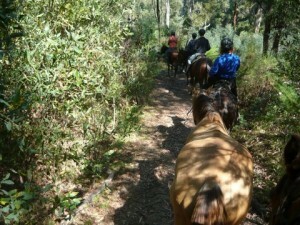 As for my other muscles, they were sore, but nothing that would stop me from enjoying a day in the saddle. My sister was the same. 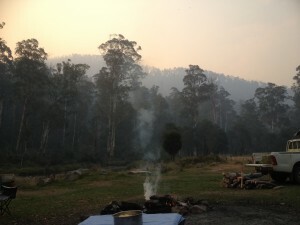 We got dressed in the frosty air in our tent and opened the flap to find that the smoke from the back-burning had cleared a little, and our camp bosses were up and about getting breakfast ready and feeding the horses. One of the horses – Ned, who was a sweat boy who didn’t trust many people but for some reason decided I was all right and came to me for pats and to be bridled – had received a nasty kick where his saddle would go, so our trail leader had to ride another horse, which wasn’t a problem seeing we’d taken along a spare horse. The loose horses were amazing – once past a certain point, they pretty much just follow the rest, and could be let off the leads. We just had to be careful at certain points where there was a split in the trail to make sure they didn’t take the shorter option and head home – they really knew where they were. 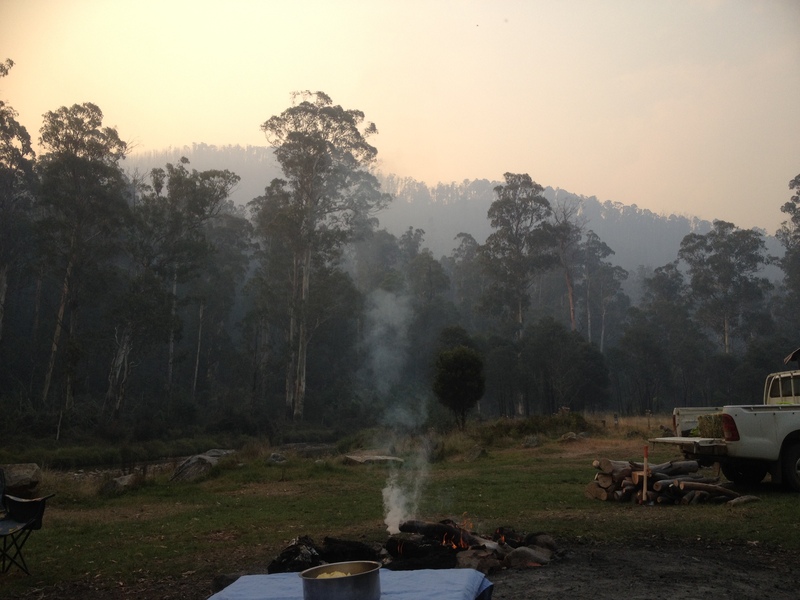 We had eggs and bacon and toast for breakfast and I’ve really not tasted anything better sitting around the campfire in the clear, cold mountain air, the smell of gum trees and horses and burn off smoke tinging the air. It was so peaceful and wonderful and I felt relaxed and exhillarated in a way I don’t feel except for when we go skiing every year. Also, my sinuses were pretty clear and I didn’t have to take any medication for the terrible hayfever which has become a bane of my existence over the last few years – which was fantastic! 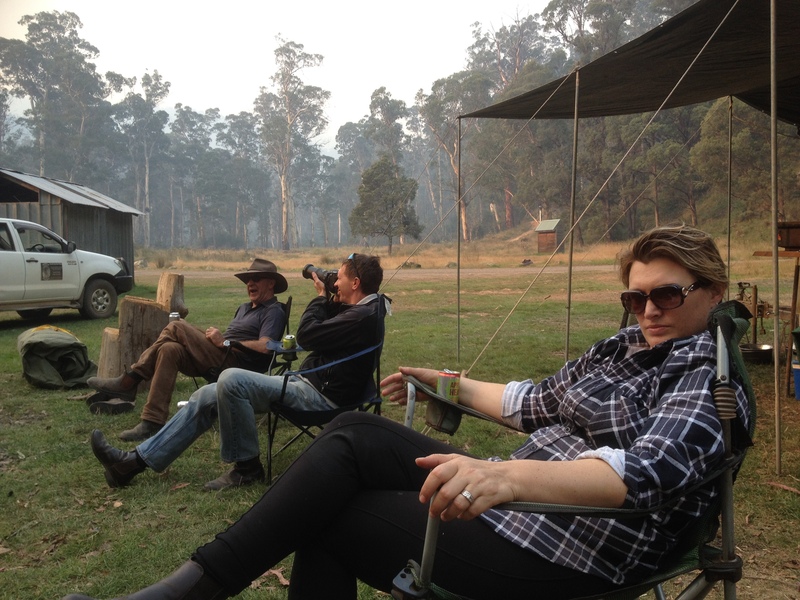 We helped feed and saddle our horses and then headed up to Craig’s Hut to see if we could see any more of the view. While the smoke had cleared a little from where we were, it was still thick enough across the mountains that we couldn’t see any more of the view than we had the day before, but it was nice to see the hut again and say goodbye to the Stirling side of the mountains, because we were about to ride down the other side from which we’d come up the day before and down into the Howqua Valley. 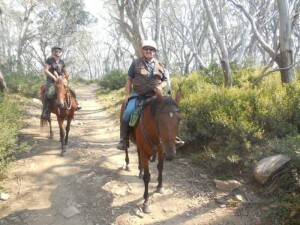 I thought riding up had been tough, but riding down was just as tough – possibly even tougher on the horses. We were riding down rocky roads that had been carved up by heavy rains and four wheel drive vehicles and it was slow going. My Uncle Richard took photos of us in front of him trying to get the perspective of just how steep it was, but the photos don’t do it justice. It was Man From Snowy River country and we were riding down the kinds of hills he rode down – except we were doing it slowly and allowing our horses to take the path they thought best for them, so nowhere near as dangerous or awe-inspiring, but still pretty difficult for us. Just when I thought my bum knee (old skiing accident) was going to snap in half from the stress of pushing down into my stirrups to keep my weight off the saddle – which was the only thing I could do to help my brilliant horse, Chelsea, on the steep terrain – we came out onto a wide road where our 4WDs were waiting for us. Along with a gleaming firetruck. 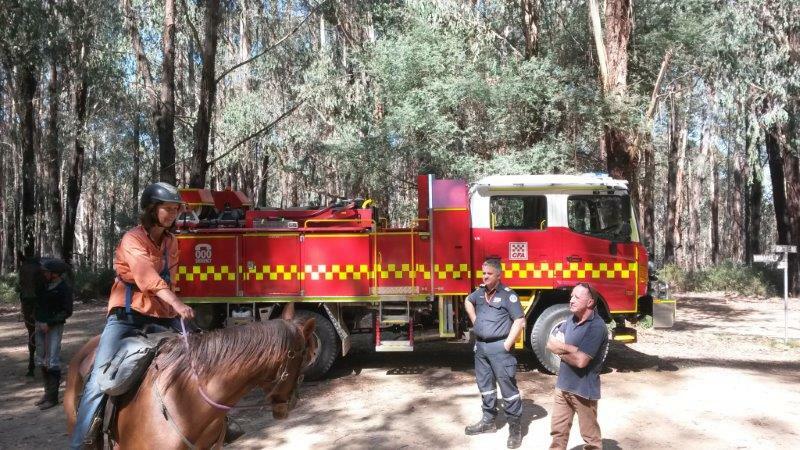 We thought the firetruck might be there for the back-burning, but it wasn’t simply gleaming red in the sun just because they’d washed it, but because it was brand new and they’d brought it out for a photoshoot. 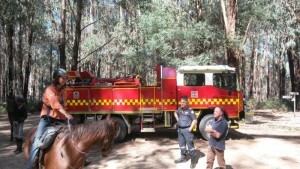 We had a much needed break and walk around, chatted with the fireys and then headed off. We kept riding downhill for the rest of the morning and up until lunch, although most of it was along fairly gentle sloping winding roads. 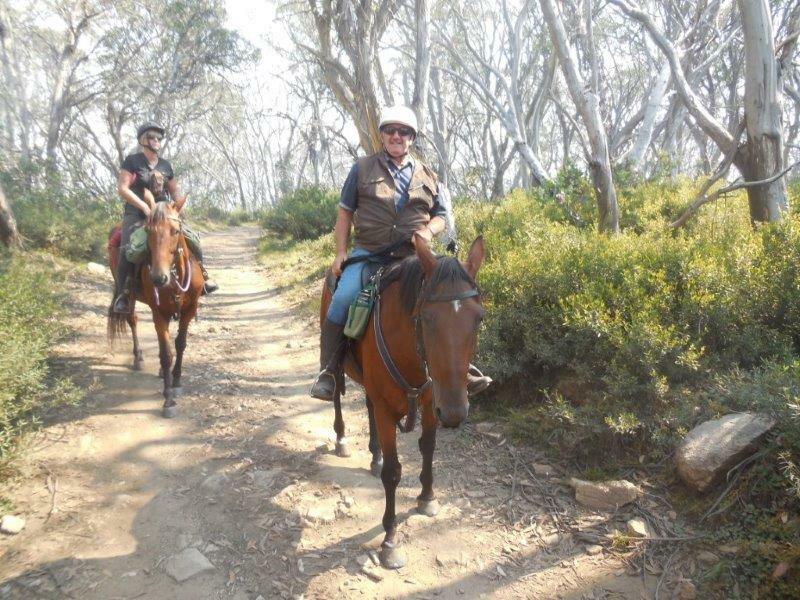 In comparison to the riding we’d been doing, it was pretty staid, but it gave us a different view of the mountains again and was the only way to get to where we were going – Pikes Flat on the banks of the Howqua river. We stopped off to look at some lovely falls (for the life of me, I can’t remember what they were called, but they were very pretty) and had a late lunch at a camping spot that many four wheel drive enthusiasts camp at, but was empty of anyone that day. The day had heated up and it was really pleasant sitting in the sun eating sandwiches and drinking cold drinks with the horses in the background and the river tinkling away beside us. We were only about an hour or so from our camp site, which we were all relieved to hear, but discovered that the hard riding of the day before was about to be repeated, because we had to ride up a small mountain and back down the other side to get down to Pikes Flat. It was worth it though, because we went through some really lovely bush that you wouldn’t see any other way. It was with relief though when we sited the flats and headed down to our camp site. 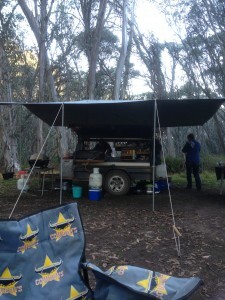 Pikes Flat was lovely and we soon had the horses unsaddled, washed and fed, our tent up, swags made up and – most amazing of all – were able to have a shower. Paul had a pump and hose that pulled water up from the river and had a gas water heater he’d built onto one of the trailers. He put up tarps and a shower head and voila! 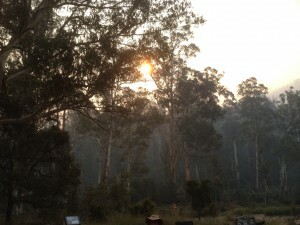 A hot shower in the middle of the Snowy Mountains. It was amazing having a shower and looking up at the trees and sky above and to feel clean after a sweaty, dusty day of hard riding was a real treat. 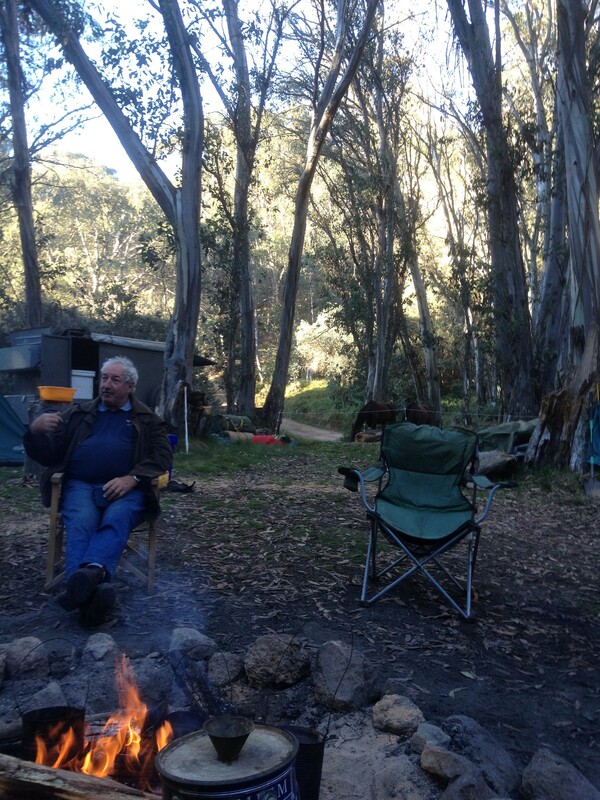 We were treated to a delicious meal again, cooked by Kay, our camp cook, and sat around the camp fire as we had the night before as Uncle Richard held court telling stories of his adventures and making everyone laugh. 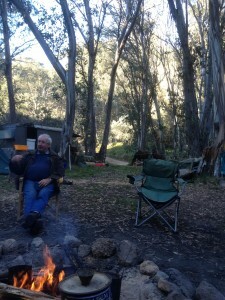 You really need an Uncle Richard type personality around a camp fire – we were all thoroughly entertained. Even my sister and I, who had heard a lot of his stories before, were laughing with everyone else and adding our own bits. 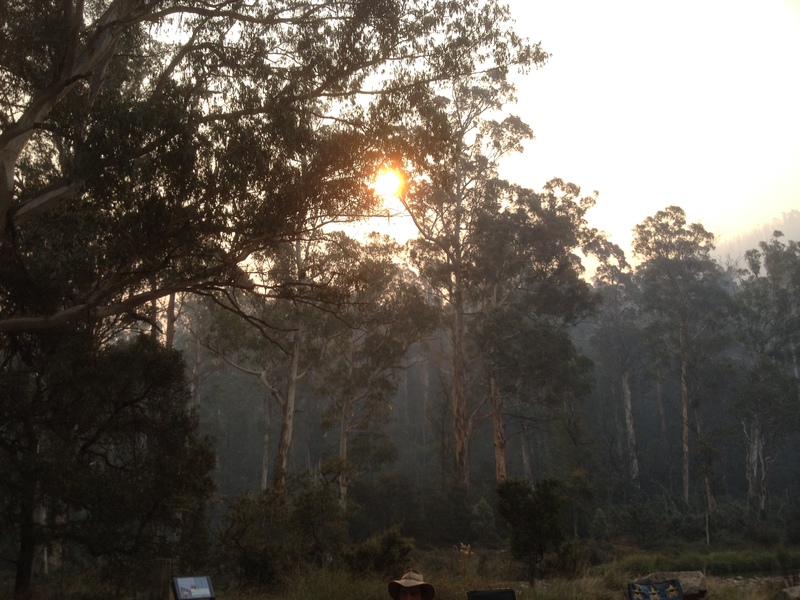 Sunset is amazing in the mountains – the soft pinks and purple of twilight seeming to last forever, and then suddenly it’s pitch black, with only the light of the moon and stars and the campfire to light the surrounds. It was all so peaceful as well, because there is no signal up there and so nobody was able to be on their phones and while we could charge our phones to take photos the next day, nobody was listening to music or anything. 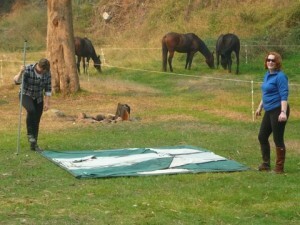 It was just the sounds of the mountains, the horses and us. That brings me to the end of the second day. I will about the excitement of our third day on the trail next time.